Winter rates are�coming -- get 20% off October through May! Check out the calendar for available dates. Welcome to the Chippewa River Lodge Resort, renowned as the most-beloved single-building resort in the Hayward, Wisconsin area. 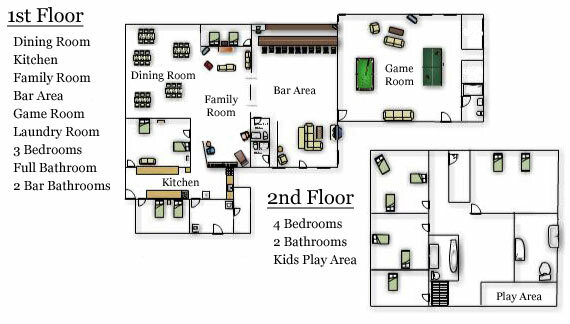 "The Lodge" in Ojibwa, Wisconsin (near Hayward, Wisconsin), is a great place to plan family reunions, corporate outings, corporate meetings, fishing trips, ATV and snowmobile outings and any event where lots of space and plenty of sleeping accommodations are needed. You're in muskie country! Fishermen and women, make sure your rod and reel are ready for the spectacular fishing options just up the river on Lake Chippewa Flowage, and at the bottom of the Winter Dam, where you can almost always find a boat of wise locals fishing for the next record-breaking muskies. The Lodge is available by the week or on weekends. There is a large kitchen for preparing your best fixings and a separate dining room overlooking the front yard (which is shaded with one hundred your old pines) and the Chippewa River. The classic pine sitting parlor, located between the dining room and bar, is a nice place for relaxing between activities. The Main Bar (you supply your own spirits), complete with a stone gas fireplace surrounded by couches, is perfect for unwinding and telling the day's fish stories. The Recreation Room, separate from the main bar, has a pool table, ping pong table and darts, where you can test your skills without disturbing those relaxing in the Lodge. It's also furnished with couches, a television, and a small stage for guitar and banjo pickin'. Please take a look at The Lodge and grounds with our virtual lodge tour. Or�Click here to take a look at some of the recent goings-on at the Lodge and around the Hayward area. To fully enjoy the majesty of the lodge one needs to experience it in person, but the provided floorplan and virtual tour will give you an idea of the overall layout. Take a virtual photo tour and see the lodge for yourself - Chippewa River Lodge Tour. NO SMOKING INDOORS -�please use patio and garbage cans/ash trays. We reserve the right to issue additional fees if the interior smells like cigarettes or excessive cigarette butts are found in the yard, driveway or patio. A great place for a family vacation or reunion. The perfect get away destination year round. 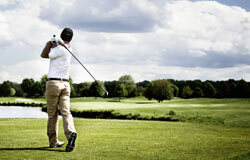 Many beautiful Hayward-area golf courses. 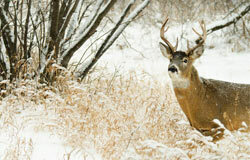 Schedule your next hunting retreat at the lodge.